(Hmm, lots of exclamation points this week. Must be more stuff from Comic Con!) Loter Studios is the creation of John Loter and his wife Shelley Loter, both of whom worked for years as Creative Directors at Disney Consumer Products. They continue to consult for Disney (and assorted animation companies) on t-shirts and other merchandising, but since 2005 they have also been creating their own line of original products based on original characters. 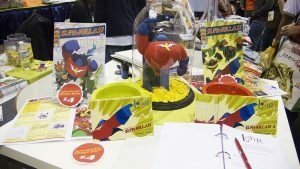 Just this year, that expanded to include their very first full-color comic book: Supa-Rillas, created with the help of John’s brother, animation director Steve Loter (Kim Possible, American Dragon: Jake Long). Simian superheroes out to save the world — all for bananas. Check out the web site to see more of what they’ve worked on. Posted in: Comic Book News, Furry Art / Portfolios, Web Sites.